These days, it seems as though people are going through larger amounts of paper every minute. Indeed, there are plenty of situations that require the use of paper. However, there is a major downside to our increasing paper consumption. As you may know, excessive use of paper is one of the causes of our planet's decline in forest area. South America's Amazon Rainforest, while still massive in size, has shrunk drastically in the past decade. If we fail to make environmentally sound decisions, this enormous ecosystem could potentially end up disappearing altogether in the years to come. Luckily, as consumers, we have the power to influence the market with our purchasing decisions. Seeded paper is a biodegradable, environmentally friendly type of paper that is made wind energy, meaning that it causes no carbon footprint. By choosing to purchase seeded paper, you can do your part to preserve our planet's well-being, and give future generations of people the chance to enjoy the wonderful forested areas that we still have today. Of course, being environmentally conscious is not the only reason to use this unique type of paper. It is also quite functional in its own right. It comes in two varieties: wildflower seeds or garden herb seeds (such as oregano, thyme, basil, and so on). It is perfect for use in various arts and crafts projects, and is generally very durable. 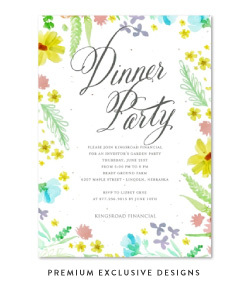 Many people find it ideal for use as an invitation card for events such as weddings, parties, meetings, and plenty of other occasions. While normal greeting cards may suffice, wildflower seeded paper has the ability to add a touch of class and uniqueness to the message that regular paper does not. Seeded paper is also exceptionally versatile, and comes available in many different colors. In addition to beautiful hues such as "Tiffany Blue" and "Curry Yellow", custom requests for more colors may be granted for a nominal fee. The special colors that are offered serve to add an extra touch of style and personality to your cards, which is sure to be noticed by those who receive them. When special events take place in your life, you want them to be memorable. In the years to come, when you look back on these pivotal moments, you will remember the little things. Why not take a step to enrich those memories with ForeverFiances excellent choice of papers? Besides displaying its wonderful aesthetic appeal, you'll also be helping the environment. View all wildflower seeded papers and garden herbs seeded papers. Wedding place cards are a small detail that makes a huge difference in how smoothly a wedding reception goes. They can be simple or ornate, whimsical or refined, but should match the tone of your wedding celebration, as well as going hand-in-hand with your wedding theme and colors. ForeverFiances wedding place cards are completely customizable to your colors, including fonts and text, and are printed on 100% recycled papers. Your wedding place cards might not rank highly on your list of fun wedding tasks, but they don't have to be a chore! Here are a few tips to consider as you shuffle guests on your seating chart yet again. Combine your place cards and your favors. If you're struggling to come up with a unique thank-you for your wedding guests, the place card is easy to dress up as a gift. Consider using our seeded paper wedding place cards, embedded with wildflower or herb seeds for an eco-chic flair. After the wedding festivities are over, have your guests relive the party with beautiful wildflowers that they can plant themselves. Feeling crafty or on a budget? 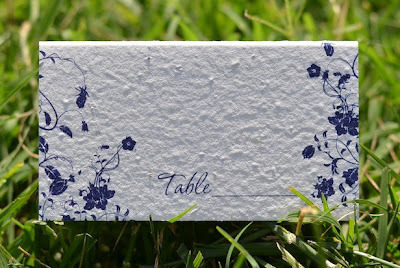 Consider making your own place cards with our DIY Seeded Paper. They come in letter-size sheets in a variety of colors, including white, cream, elephant gray, desert brown, bright green, tiffany blue, and many more. Check out our seeded papers here! Designing every last detail is part of the fun of wedding planning. Wedding place cards are one more way a couple can showcase their creativity and taste. These simple mementos from ForeverFiances can be a guest's lasting keepsake from your special day. Life is a dynamic journey that has its fair share of ups and downs. To take full advantage of all the good things that come our way, it's nice to throw a celebration during times of happiness and joy. From high school graduations and college graduations to birthday parties and marriages, there are plenty of life events that deserve having a party for. For Jewish girls who are making the transition from adolescence to adulthood, Bat Mitzvahs are held to celebrate their acceptance into the Jewish community with full membership and the right to participate in all religious activities. This joyous occasion is spent with friends and the extended family eating, dancing, and engaging in religious rituals. 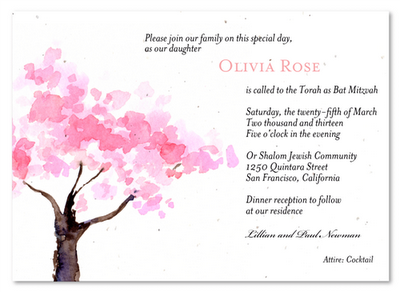 If you are planning to throw a Bat Mitzvah for your precious little girl, ForeverFiances has the greatest selection of Bat Mitzvah invitations around. Why Choose ForeverFiances for Your Bat Mitzvah Needs? 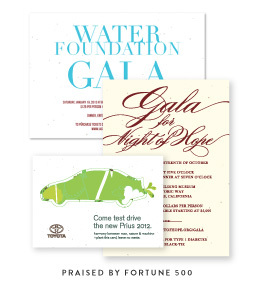 ForeverFiances specializes in special event invitations that are made of 100% recyclable paper. Everything from the paper invitation itself to the envelope it is wrapped in can be recycled. The company prides itself on producing the most creative and highest-quality invitations while remaining eco-friendly at the same time. ForeverFiances is very committed to promoting sustainable resources and the conservation of waste so that we can preserve our already limited resources while reducing pollution. The beautiful Bat Mitzvah invitations, along with the rest of the invitation line-up, are designed with the signature "plantable paper" that contains a randomized assortment of flower seeds. If just having the invitation is not a good enough reminder of this important stage in your lovely daughter's life, plant the paper in soil and water to watch it sprout flowers to remind you of how beautiful the occasion was. 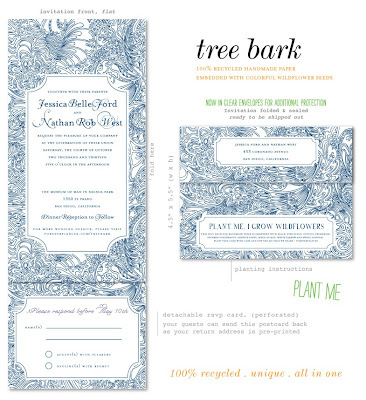 You even have the option of customizing your invitations by sending in your own designs so that they can be applied to the blank plantable paper. Your daughter's Bat Mitzvah is a precious moment in her life that is an important stepping stone for her future. If the future of your children is the most important thing in your life, help to preserve it by using ForeverFiances Bat Mitzvah invitations. Green stationery will aid in preserving our trees and forests so that your kids get the opportunity to enjoy their adult years like you did. If you want affordable, environmentally-friendly products that are unique and memorable, purchase your invitations from ForeverFiances. 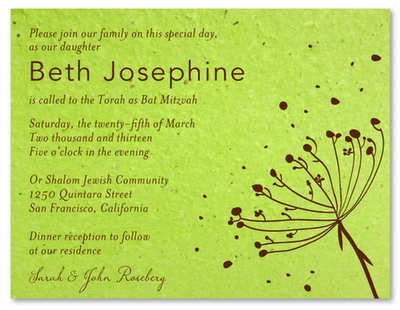 Discover our full Bat Mitzvah Invitations collection. 'Tis the season to tie the knot, and it's almost time to send out your winter wedding invitations. What better way to commemorate your winter wonderland wedding than with seeded paper invitations that will bloom in the spring? The designers at ForeverFiances have created beautiful winter wedding invitations that are elegant and whimsical, with snowflakes, tree bark, and birch designs—without that Christmas tinsel feel! All of our invitations are fully customizable, and you can choose your colors, fonts, and paper to match the wedding of your dreams. 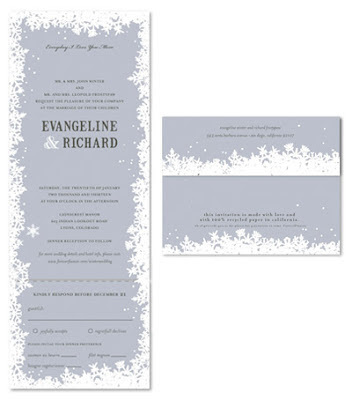 Take a look at some of our most popular winter wedding invitations. 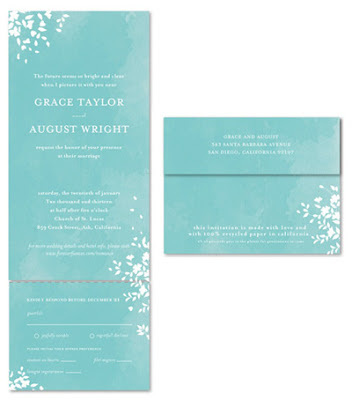 The Winter Romance invitation is printed on a beautiful aqua watercolor printed background. Its simple design and its complex textures speaks for itself in making the the purity and effortlessness of your love the focus of your winter wedding. The Winter Romance collection is also available in a classic format for our more traditional brides. Discover the Romance Wedding Stationery. Give your guests a taste of what's to come following your winter wedding with this beautiful seeded paper invitation highlighting the image of a tree–the symbol of strength and life. Plant your invitations in the spring and watch beautiful wildflowers bloom to commemorate the vibrancy of your new marriage. Though it may be cold outside, your love will keep you warm! Invite your guests to your winter wedding with the all in one Winter Frost wedding invitations, featuring a lovely snowflake design in a Silver Bells color theme. 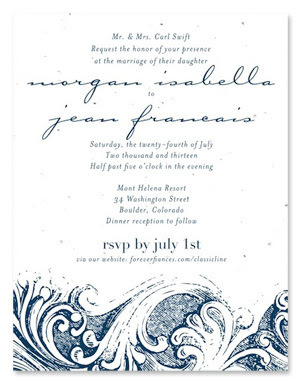 Made as an affordable option in a smaller format, the French Swirls invitation, printed on seeded paper, evokes images of old churches full of history and traditions. The sophisticated pen and ink drawing is perfect for any bride looking to bring old world charm to her winter wedding day. Nestled into the bark of the legendary family oak tree, this wedding suite will inspire organic beauty. Perfect for your eco-chic wedding. 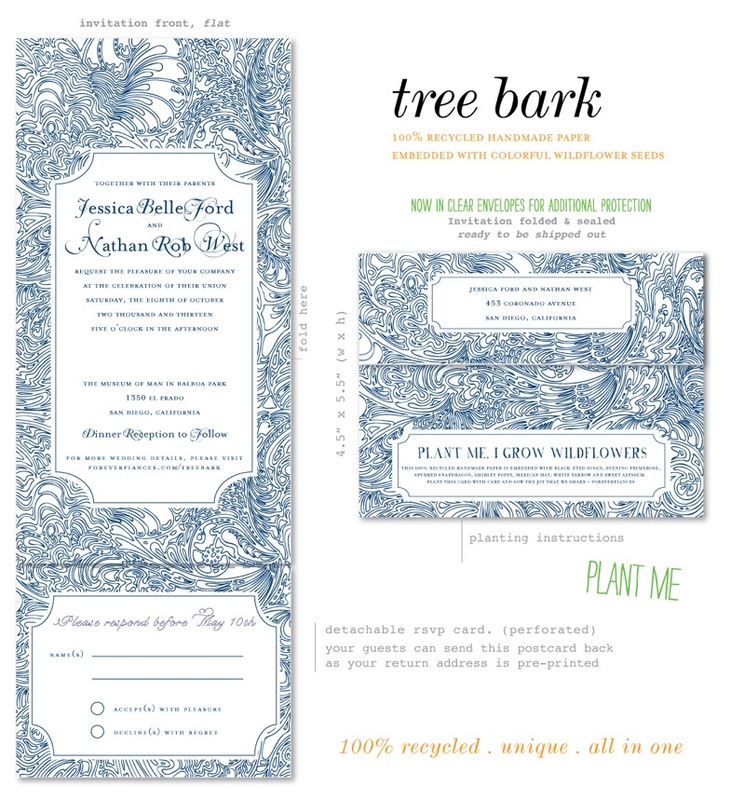 Your wedding deserves the greenest invitations! 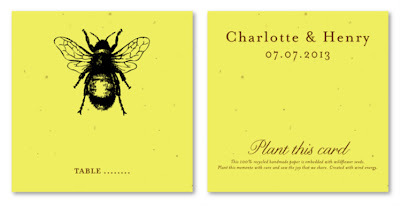 Printed on 100% recycled, seeded paper which blooms into wildflowers (once planted). Featured in Buddha Blue. Discover our complete collection of winter wedding invitations. ***keep in mind that any collection/design on foreverfiances can be customized with your winter frosty colors. Stand Out with a Unique Bar Mitzvah Invitation!